The natural medicine of today is a far different animal than it was a generation ago. In a society hungry for alternatives to conventional medical practices, ‘natural medicine’ has come to include any method that avoids the use of pharmacotherapy. With Dr. Oz touting the latest and greatest natural health phenomenon, detox foot baths, oil pulling, and so on, it can be easy to lose sight of the conceptual model that make natural medicine so effective. It’s not unusual for people to come to their appointments with their entire arsenal of supplements hoping for some clarity as to what they need to be taking. When asked why they are taking supplement ‘x’ I often hear “That’s agood question! I’m not actually sure. I think I read it somewhere in a magazine”. As naturopaths, a big piece of the education we offer to our patients is providing the framework with which to interpret their symptoms and decide on an appropriate course of action. This framework, regardless of how your naturopath formulates their assessment or the modality used, ultimately works on a ‘systems based’ approach in that our symptoms are the result of an issue ‘upstream’. Support the weakened system and the ‘downstream’ issues get resolved. It’s this ‘systems based’ approach that provides the direction necessary to focus on the remedies needed and hold off on others even though they might be ‘good for you’. One such ‘upstream’ system is your liver. To those of you who have been receiving this newsletter for a while, this may seem like old news. So old in fact that it is often forgotten when attempting to figure out, as a for instance, why at the age of fifty, you’re all of a sudden constipated, bloated, fatigued and having the worst hot flushes of your life. It can be easy to think of all the herbs and vitamins that are involved in balancing out hormones like estrogen and progesterone or to make dietary changes that avoid the inflammation associated with troublesome hot flushes. But what’s to be done when these interventions don’t quite deal with the problem as you had hoped? 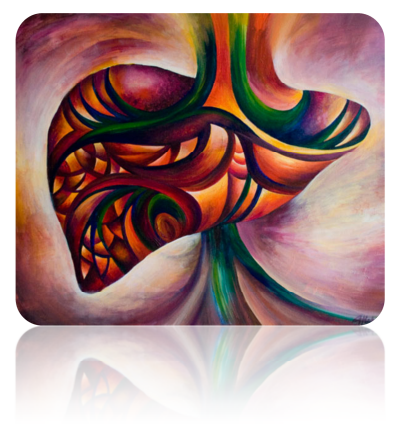 Have we forgotten that a well-functioning liver is essential for optimal hormone balance? As another ‘for instance’, what if all of a sudden you are beset by a rash so itchy that you can’t sleep at night and you’re wearing socks on your hands to protect yourself for scratching yourself to infection? Have we forgotten that toxic compounds not eliminated by the liver and kidneys will look to the skin as a way to be eliminated? “But I detoxify twice a year” you say. Detoxifying semi-annually and annually is certainly helpful in mitigating the toll of modern life on your liver but it is not a guarantee that your liver will never be impacted and in need of support outside those times. Excessive stress, pharmaceutical drugs, alcohol and sugar consumption, nutritional deficiencies, processed food, environmental chemicals, plastics in the home, the list goes on, can all potentially compromise liver function. Signs of dysfunction go beyond jaundice, pain in the upper right hand side and abnormal liver function tests. They can also include: lowered immunity, headaches, trouble balancing blood sugar, poor metabolism of fats (LDL will go up and HDL will go down), digestive issues (bloating, constipation, IBS, heartburn), rashes, bad breath, difficulties absorbing nutrients from our food (liver has a role in making the nutrition from our food bioavailable) which impacts mood, memory and concentration, keeping anger in check, and premenstrual symptoms such as breast tenderness, cramping and a heavy flow with clotting. The Chinese take it further implicating the liver in such things as sleep patterns (anyone out there consistently get up between 1 and 3 am? ), the quality of your sight and health of your nails. As naturopaths, we often see the chronic issues that the conventional model is at a loss to deal with. At times pharmacotherapy is needed to help manage symptoms that are intolerable. Life may become more manageable but the underlying cause goes unaddressed. Using a ‘systems based’ approach provides a broader framework with which to interpret symptoms and offers a direction in terms of treatment. Treating the liver is not the answer to all chronic health issues but it is certainly a key player in maintaining our overall health. It’s a little like a rain barrel: try never to let it get too full by keeping the spigot open at the bottom. Our humble liver is the spigot and our bodies, the rain barrel. Provided we have a little room at the top to collect rainwater, we’ll never spill over. Keep caffeine, alcohol and sugar to a minimum.